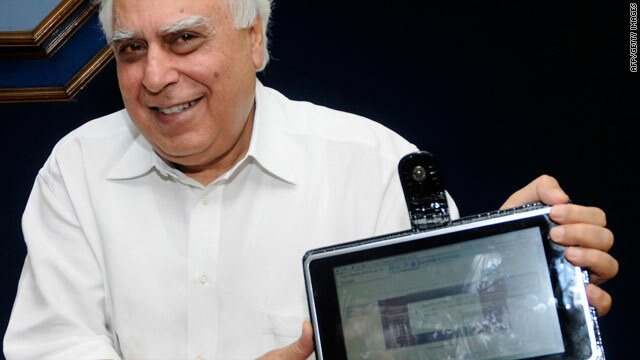 Indian government minister Kapil Sibal unveils a prototype of the $35 computer. India: Connectivity to all colleges is key to achieving education goals. New Delhi, India (CNN) -- India has unveiled a $35 computer prototype as part of its program to provide connectivity to its students and teachers at affordable prices. Kapil Sibal, the country's human resources development minister, displayed what he called a low-cost computing and access device in New Delhi on Thursday. The ministry said the price would gradually fall to $10 apiece. Home to a billion-plus population, the country's literacy rate stands at 65 percent, according to the 2001 census figures. Nevertheless, the South Asian nation has made giant strides in various areas since it opened up its economy in the early 1990s. The country ushered in a telecom revolution that delivered mobile telephony to nearly 600 million people in just a little more than a decade with highly competitive call tariffs. Now, India is preparing for another leap into the digital world. Recently, it auctioned off its airwaves for third-generation services to enable super-fast multimedia streaming of wireless. The move is aimed at bringing India's online market on a par with its booming cell-phone business through Internet penetration with technology allowing quick access, data transfer and entertainment on mobile handsets. The country has announced plans to link up all its 250,000 village councils by 2012 in a bid to plug massive broadband divides between rural and urban communities as it emerges as one of the world's few growth markets. Authorities say technical institutions involved in designing the new device are now setting up research to address price and quality issues in developing budget gadgets for students. "The aim is to reach such devices to the students of colleges and universities, and to provide these institutions a host of choices of low-cost access devices around Rs 1,500 [$35] or less in near future," the human resources ministry said at the launch of the computer. Ministry spokeswoman Mamata Varma said the government aimed to introduce the new touch-screen computing tool at higher educational institutions in 2011. The ministry, she said, is expected to tender out contracts to private companies for mass production of its prototype.